For Ages: 5 to 7yrs., 8 to 10yrs., 10 to 14yrs. This is the Fairy Tale story of The Snow Queen. It has been adapted from Hans Christian Andersen's version and is brought to you by Stories to Grow by. ONCE THERE WAS AN EVIL WIZARD who made a mirror with his dark magic. If anything good or beautiful was put in front of the mirror, the reflection that showed back was only rotten and gray. The wizard laughed. He wanted to show his evil mirror to the whole world! He took it and flew up high into the sky. He flew so fast that the mirror started to shake. He could no longer hold on to it and the mirror dropped! It smashed into many tiny sharp bits of glass on the ground. The wind blew the glass all over the place. From then on, if one bit of that evil glass blew into anyone’s eye, that person would see only the bad and dark in people, no more the good. So it was in that land. Years later, a boy named Kai and a girl named Gerda were friends. They lived next door to each other. Both of them had their bedrooms in the attic. When they opened their attic windows, they were so close they could reach out and touch fingers. An old gutter ran between the two roofs. In the gutter where water ran through, the families had planted a garden with vegetables and roses. It was like Kai and Gerda's very own garden. Kai and Gerda’s families were poor. There were no toys to play with. But they did not mind. They played in their garden on the roof, and were happy. When they opened their windows, they were so close they could reach out and touch fingers. One day, Gerda and Kai were on the roof weeding the garden. All of a sudden, a gust of wind blew by. It blew a sharp bit of that evil glass right into Kai’s eye. He stood up, stepping on the roses. "I do not want to weed this stupid garden anymore!" he said. "Okay," said Gerda. "Do you know you're stepping on the roses? How about a clapping game?" But Kai cried out, “I don't care if I step on all the roses! And I never want to play with you, Gerda. Ever again!" The next day, Kai took his sled into town. Ah, that sled was so slow! A big white sleigh was coming down the road very fast. The sleigh came close to Kai and as it did, it slowed down just a bit. Kai had an idea. He quickly tied the rope of his sled onto the back of the sleigh. Now he could ride behind on his sled! But what Kai did not know is that driving the sleigh was the evil Snow Queen. The Snow Queen, in her white fur coat, had known very well that Kai was on the road. She had slowed down her sleigh when she got closer, to give him a chance to tie on the rope. She did not turn around to look. She knew that Kai was speeding along behind her. Soon he would be near frozen with cold. Then, she knew, it would be easy to make him hers. But what Kai did not know is that driving the sleigh was the Snow Queen. Kai nodded. She kissed him on the cheek. He no longer felt cold. “Now, one more kiss,” said the Snow Queen. “With this one, you will forget all about Gerda and your family.” Before Kai could say anything, the Snow Queen had kissed the other cheek. She laughed and said, “If I kissed you a third time on your forehead, you would die. But I have things for you to do for me back at my palace.” Then she got into her sleigh and drove on. Kai did not return home that day. Or the day after that. You can imagine how upset everyone was! They said poor Kai must have drowned in the river. Gerda ran down to the river. She called out to the waters rushing by - Is it true? The river would not say. Gerda took off her red shoes and held them up. She said she would throw her red shoes into the river, if only the river would give back Kai. But the river would not let her throw in the shoes. And that is how Gerda knew that he must not be under the water. Gerda went many places looking for Kai. She went to see a witch. The witch tried to trick Gerda into staying with her forever. Gerda ran out very fast, just in time. Then she met a crow. The crow told Gerda that to find Kai, she must go to the palace of a Princess. So off went Gerda to the palace of the Princess. She did not know anything about Kai. But sey gave Gerda warm clothes and a beautiful coach she could ride on her way. Gerda was riding her coach when a band of robbers jumped up from behind. The robbers were led by a Robber Girl. The Robber Girl made Gerda go into the back of the coach. Then she took the reins. And Gerda was her prisoner! Poor Gerda! She had lost her coach. She was a prisoner. And she had no more clue than ever where to find Kai. The Robber Girl took Gerda back to the house where she lived. Gerda must sleep in the barn, in a corner next to a reindeer. When the Robber Girl had left, Gerda cried out, “Oh Kai, where are you?” Two white dove birds up high in the loft of the barn, heard her cry. “What a sad day that was!" said the other dove. 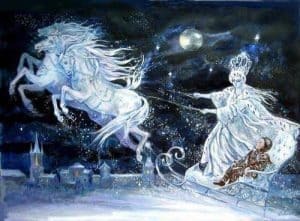 "That was when the Snow Queen drove by on her sleigh. The boy Kai was riding behind on his sled, very fast." “How will I ever find this place, Lapland?” said Gerda. “Please, could you take me there?” said Gerda. The Robber Girl was just outside the barn door all this time. She was not really so mean after all. She went into the barn and cut the ropes that bound the reindeer. She helped Gerda mount the reindeer and gave her a cushion to sit on. She even gave Gerda a pair of fur boots, two loaves of bread and a piece of bacon, too. "Be off now," said the Robber Girl. "Find your friend." Off like the wind flew Gerda and the reindeer. They rode and rode until it got dark. Then they needed to find a place to stay for the night. They knocked on the door of a hut. An old woman opened the door and welcomed them in. Gerda and the reindeer told her about their search to find Kai. The old woman said, “You still have a long way to go to get to Lapland. The Snow Queen's palace is 100 miles away." "How will we find it?" said Gerda. “The windows of her palace burn with a blue light that can be seen for miles around," said she. "You can't miss it. But when you get there, do not go right up to the palace. First, look for a cabin nearby with a red door. Inside that cabin lives a Lapland woman I know." The old woman picked up a piece of dried fish and wrote some words on it. “Give her this fish," said the old woman,"and she will help you." The next day, the reindeer and Gerda rode as fast as they could. They flew like the wind for three days. On the third day, they saw blue lights from afar. When they got closer, they saw it was a large, dark palace, Nearby, just as the old woman had said, was a cabin with a red door. Very cold they were by then, and hungry too. And glad when a Lapland woman opened the door and let them warm themselves by her fire. The next day, the reindeer and Gerda flew like the wind. Gerda told her that they had coming looking her dear friend Kai. And that Kai was last seen with the Snow Queen. She handed the fish to the Lapland woman. She read the words on the fish three times. Then she put it in the pot on the fire for soup, as she never wanted to waste anything. “Did it tell you anything at all?” cried out Gerda. “Surely something can be done!” cried Gerda. “What will I do?” Gerda cried out. “Look at what you have already done!" said the Lapland woman. "Look at how far you have already come." And so Gerda mounted the reindeer, and off they went. “Oh, no!” said Gerda after the cabin was no longer in sight. “I left my fur boots behind!” But there was no time to go back. So on they went. At the bush with red berries, Gerda climbed off the reindeer. There she was, with no boots and her feet bare in the cold snow. But the Snow Queen’s palace was right ahead of her, its blue lights burning in the windows. So Gerda walked on. As she went, she called and called for Kai. At last, there he was! He was sitting on top of a frozen lake, down on his knees. A throne sat on the lake, and it was empty. The Snow Queen had given Kai a job of setting pieces of ice into words. Other pieces of ice he must make into numbers. For this frozen lake was the Lake of Reason. And the throne was the very throne of the Snow Queen. At last, there he was! "Kai!" called Gerda. But he did not look up. Kai's skin was dark blue, as if he was frozen. He had so little feeling left he did not even notice the cold anymore. The Snow Queen was away and Kai was busy with his task, working on the frozen lake. He moved one piece of ice here and another there, making the words and numbers. At last, Kai looked up. But he looked right past her with his deep dark eyes, and did not see her at all. Gerda burst into tears. Cold and cutting was the wind on that lake. As Gerda cried “Kai, where are you?” one of her tears blew right onto Kai’s face. The tear burned his face until his whole face felt hot. Then Kai, too, was crying. “Gerda!” said Kai, “is that you?” Kai shivered. He cried with joy, for the evil bit of glass was washed from his eye. Kai took Gerda’s hands. Though they were both frozen cold, each of them felt warm inside. Gerda and Kai walked hand in hand back to the bush with the red berries, where the reindeer waited. As they walked, the sun came out and warmed and dried them. The wind stopped and birds started to chirp. Before they knew it, there was the reindeer, in front of them. The reindeer took them back the the first old woman, who gave Gerda a new pair of fur boots. Each of them got a fur hat, too. As the reindeer carried them on the long road back home, who came along the road but the Robber Girl! She was riding the coach she had taken from Gerda, but Gerda was glad to see her, just the same. The Robber Girl said to Gerda, “So this is the friend you traveled all the way across the world to save. I hope he was worth it!” They all smiled. The Robber Girl said they should hop on her sleigh and she would give them a lift home. By the time they finally got home, it was summertime. Much to their surprise, they were all grown up. It was summertime, and they were all grown up. In the years that came to be, Gerda and Kai stayed the best of friends. There were no more adventures with the Snow Queen or the cold frozen north, and each lived a quiet life. But they knew deep down that no matter what, they would always look out for each other. Why did Gerda keep looking for Kai after he was mean to her? This story has been adapted from "The Snow Queen" (Danish: Snedronningen), an original fairy tale written by Danish author Hans Christian Andersen. The tale was first published 21 December 1844 in New Fairy Tales. First Volume. Second Collection. 1845. (Danish: Nye Eventyr. Første Bind. Anden Samling. 1845.) The story centres on the struggle between good and evil as experienced by Gerda and her friend, Kai.